Graduate students spend years toiling over their research; their dissertations can run hundreds of pages. But over the past few weeks, dozens of UNH graduate students took on what might have been the biggest challenge of their academic careers to date: They described their research in lay terms in just three minutes. 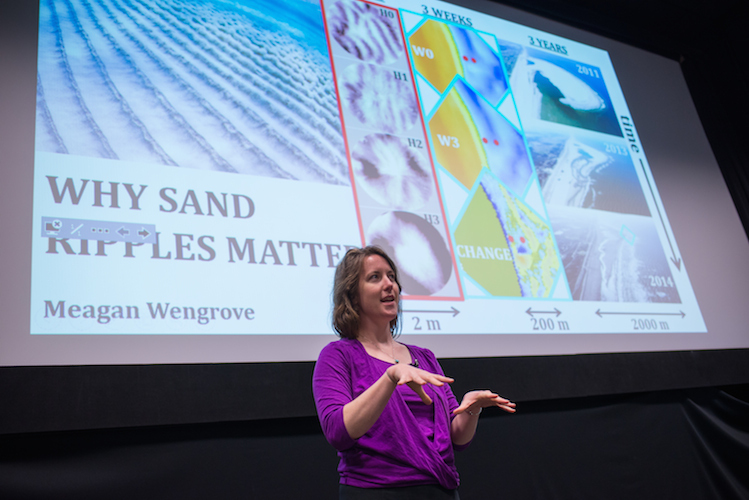 Ocean engineering Ph.D. student Meagan Wengrove won second place in the 2017 3 Minute Thesis competition. Resisting that temptation through two rounds of competition, mechanical engineering Ph.D. student Drummond Biles took the top honor for his cogent explanation of thermal efficiency in automobiles. Modern cars, he said, lose up to 30 percent of the energy from gasoline to the colder metal surrounding the engine. Connecting the concept to his audience’s lives, he translated that energy loss to 68 million gallons of gasoline just from commuting, or “250 times the volume of this theatre here.” His research aims to understand how that heat gets lost, leading to greater fuel efficiency in vehicles. Ryan Stephens’s work on how small mammals pollinate forests won third place — and identified five new species of New England truffles. Our forests face pressure from climate change, invasive insect species and timber harvests, Stephens said, so he’s exploring ways that small mammals, “the foodies of the forest,” can make our forests more resilient. The people’s choice award went to Reverend Holland Prior, pursuing a Master of Fine Arts in nonfiction writing, for her work on the rise and fall of women in the American clergy. Jovana Milosavljevic Ardeljan, a Ph.D. student in education, was runner-up for her research on how graduate students can develop communication skills. Watch Drummond Biles' 3 Minute Thesis here. Find videos of all the 3 Minute Thesis competitors here.